DANYORE, Pakistan (Thomson Reuters Foundation) – One night was all it took for Bibi Baskiya’s fortunes to be reversed. In June the young farmer had sown maize on half an acre of land in Danyore, a scenic mountain village in northern Pakistan’s Gilgit-Baltistan province. On Sept. 12 it was sunny and the skies were so clear that Baskiya watered her crop from a nearby spring, certain there would be no rain. But that night, her hopes of a good harvest were destroyed. “A sudden rainstorm and heavy winds flattened 80 percent of the standing crop,” she said. The maize is now only good to be used as fodder for her cattle, and she will not recover the cost of cultivating it. Baskiya is one of many farmers in this remote region whose livelihoods are threatened by the effects of erratic weather and climate change. Experts say measures are desperately needed to help them adapt to unreliable rainfall, but few – if any – are available so far. Maize is the most important summer crop after wheat in northern Pakistan’s Upper Indus Basin (UIB). The grain is harvested to eat, while the stover (dried stalks and leaves) is used to feed livestock during the winter. 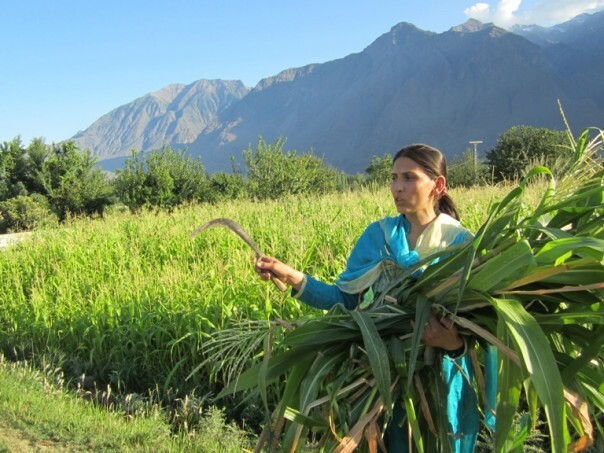 “Owing to erratic weather patterns, the area under the staple crops in most of Gilgit-Baltistan province in UIB has shrunk alarmingly, and vegetables are now being grown as cash crops,” said Asmat Ali, director of the province’s agriculture department. An estimated 70 percent of the wheat consumed locally must now be imported from Punjab province in eastern Pakistan and Sindh in the south, Ali added. Cash crop farmers are also suffering the consequences of extreme weather. Ali Da’ad, 50, a vegetable farmer in Danyore, said his potato and tomato crops have been struck by lightning several times. “There has been a significant escalation in lightning activity and thunderstorms over the last 10 years, particularly during summer months,” Da’ad said. The lightning has triggered fires, damaging crops and endangering populated areas. At the same time, rainfall is increasingly unpredictable, causing crops to fail. Muhammad Iqbal, chairman of Local Support Organisation Danyore (LSO-D), a nongovernmental group working for rural development, said rains are unequal even within Danyore village. “When it rains in the eastern part of the village, the west remains without it,” he said. Gilgit-Baltistan is home to the world’s largest frozen water reservoir, which feeds the Indus river system – a lifeline for Pakistan’s agro-based economy. Farmers in the province depend on melting snow from April onwards to replenish streams, enabling them to sow seasonal vegetables and maize from late May. But Da’ad said prolonged winter weather is causing the snows to melt later, making it difficult to plant crops in time. Nek Parveen of LSO-D said this year streams filled 50 days later than expected. “Women wheat farmers in Sultanabad village (adjacent to Danyore) suffered substantial financial losses early this April, as they had to prematurely harvest after farmers sensed (the crop’s) growth had halted,” Parveen said. According to Ghulam Rasul, a scientist at the state-owned Pakistan Meteorology Department in Islamabad, rainfall in the province has become less frequent but more intense over the past 50 years. The decrease in winter precipitation and snowfall due to rising temperatures in the area is affecting Pakistan’s hydrological cycle and hampering the country’s agricultural growth, Rasul said. “Investing in farmers’ climate adaptation capacity building and knowledge development can help them cope with impacts of climatic variability on their crops,” said LSO-D’s Iqbal. Iqbal sees a need for the construction of small or medium-sized reservoirs in the foothills and plains, so that water from streams can be harvested for use during the dry season and the winter, both for farming and domestic purposes. But there has been little progress in the province so far, where development agencies are hampered by the inaccessibility of much of the terrain, political inertia, and a volatile security situation due to conflict between Shi’ite and Sunni Muslim sects. Jamil Uddin, who manages programmes in the Gilgit region for the Aga Khan Rural Support Programme (AKRSP), said his organisation plans to introduce climate mitigation and adaptation measures for the province’s farmers. “Our experiences show that information-sharing programmes for mountain farmers and communities about better, proven adaptation and mitigation measures can enable (them) to cope with the aftermath of rapidly occurring climatic variability,” he said. The AKRSP hopes to bring climate-resilient crop varieties and water conservation technologies to farmers. According to LSO-D’s Iqbal, transmitting weather forecasts via FM radio and free SMS texts on mobile phones would help farmers, who now rely on indigenous techniques that are increasingly inaccurate as weather patterns become harder to predict. Iqbal emphasised that helping mountain farmers adapt to the impacts of climate change is vital to support the livelihoods of rural people and maintain an acceptable level of food security. Saleem Shaikh and Sughra Tunio are climate change and development reporters based in Islamabad, Pakistan. This entry was posted in Agriculture, Biodiversity, Climate Change, Extreme weather events, Floods, Gender, Glaciers, Global warming, Lightning, Rivers, Saleem Shaikh, Water and tagged Adaptation, Climate change, Danyore, erratic rainfall, Gilgit, Mitigation, River, warming, Water by saleemshaikh. Bookmark the permalink.